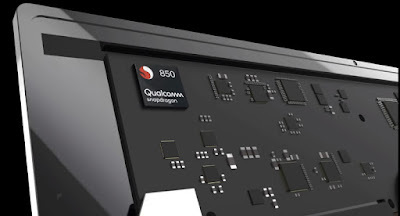 Qualcomm has introduced the Snapdragon 850 Mobile Compute Platform for Windows 10 PCs. Samsung is the first OEM to implement the Snapdragon 850 for Always-on, Always-Connected User Experiences. The Snapdragon 850 Mobile Compute Platform features the Snapdragon X20 LTE modem and the Qualcomm AI Engine in a future device. Snapdragon 850 Mobile Compute Platform is designed to support after smartphone features in the PC and to stay connected to LTE or Wi-Fi so users can receive notifications and have their data virtually always synced on the go. It packs power-efficient architecture and is engineered to support up to 30% system-wide increase in performance and up to 3X AI performance over the previous generation. It supports up to 1.2 gigabits per second LTE connectivity speeds.It is designed with 10nm leading node efficiency and also supports on-device AI and users can also expect camera, voice and battery life enhancements. Building on the portfolio of Always On, Always Connected PCs established over the past year, we are thrilled to work with Samsung to help offer consumers true mobility combined with the productivity and entertainment features of Windows 10. To truly expand this category, our work with mobile leaders like Samsung is important to help us deliver the next generation of Always On, Always Connected PCs to consumers. Snapdragon 850 Mobile Compute Platform devices with Windows 10 will be available later this year. In a different note, Qualcomm has also announced a joint effort with Sprint to offer its customers free unlimited data in 2018 with AutoPay on Qualcomm Snapdragon Always Connected PCs from Asus, HP, and Lenovo. Snapdragon 850-powered PCs will be available later this year.